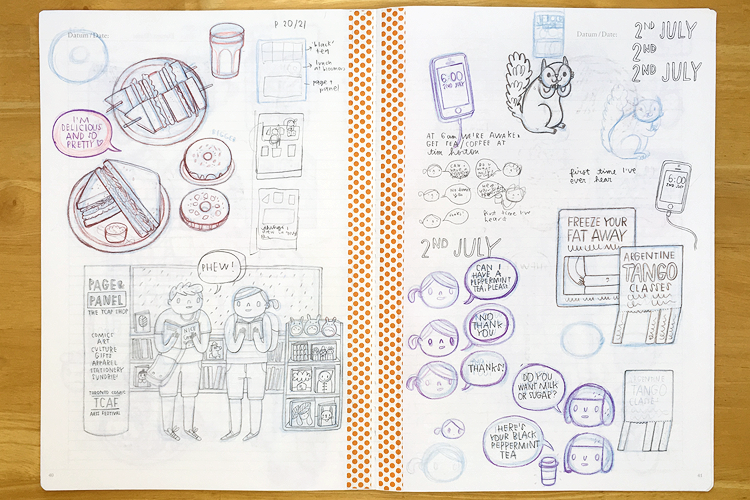 As you can see during our trip I just made very messy scribbles and notes in my sketchbook. When we're on holiday, James and I like to wake up, walk and explore all day (often 10 hours of more) and then fall into bed exhausted at the end of the day. 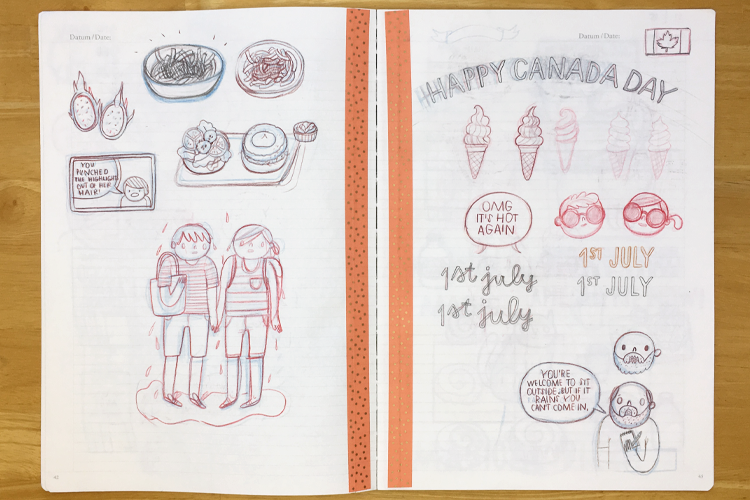 There isn't ever much time to draw, let alone put effort into making a pretty sketchbook! 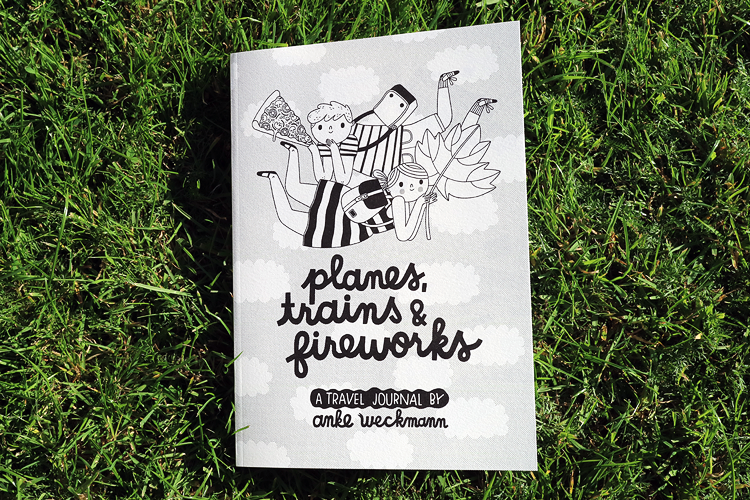 This is an A5 Travelogue Handbook sketchbook, by the way. 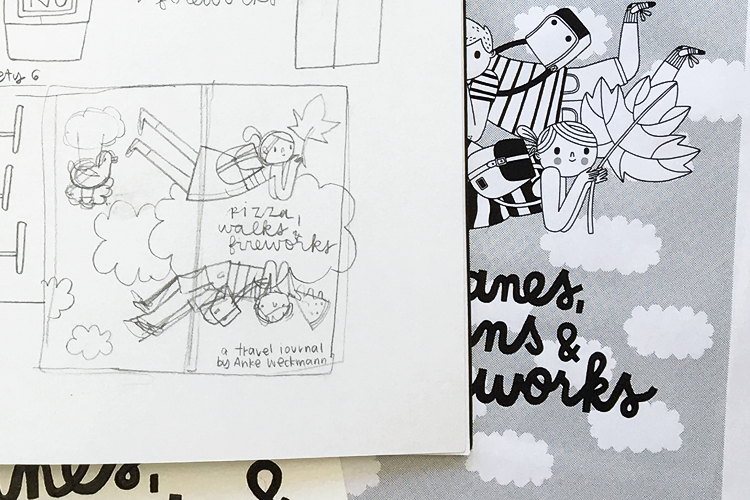 Back home in London, I made a rough plan/storyboard for the travel journal I wanted to make. 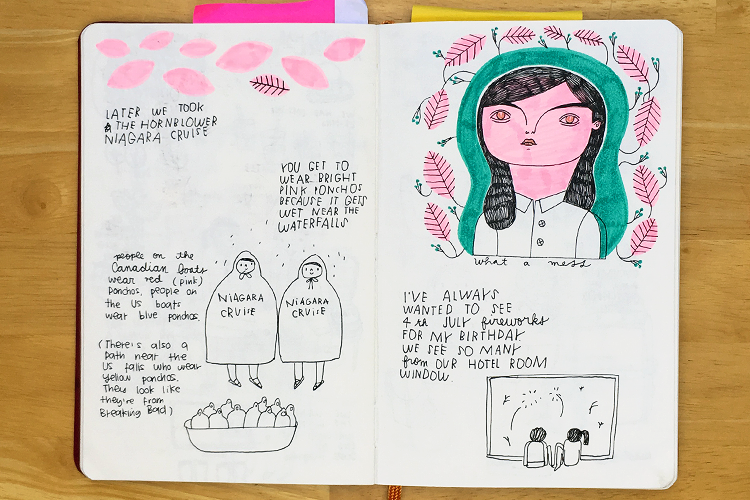 I went through the sketchbook I kept on holiday and roughly divided the content into pages. 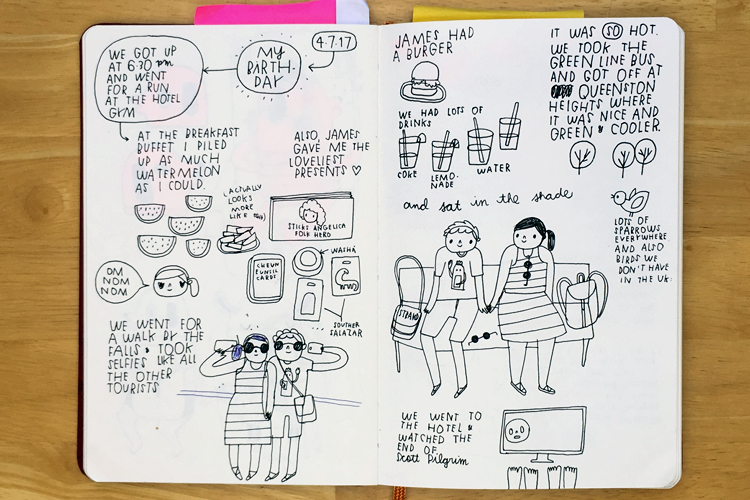 This time I used an A3 Seawhite Of Brighton sketchbook, because I needed the space! Then I started to make sketches for the book. Since my original drawings were very basic, I used the photos I took on holiday as reference - for example for all the food we ate. Some things I googled as well, like images of chipmunks which I then drew a few times for practice. (This is a random A4 Leuchtturm lined notebook. The pages were perforated so I taped them with washi tape to make sure they wouldn't rip out). 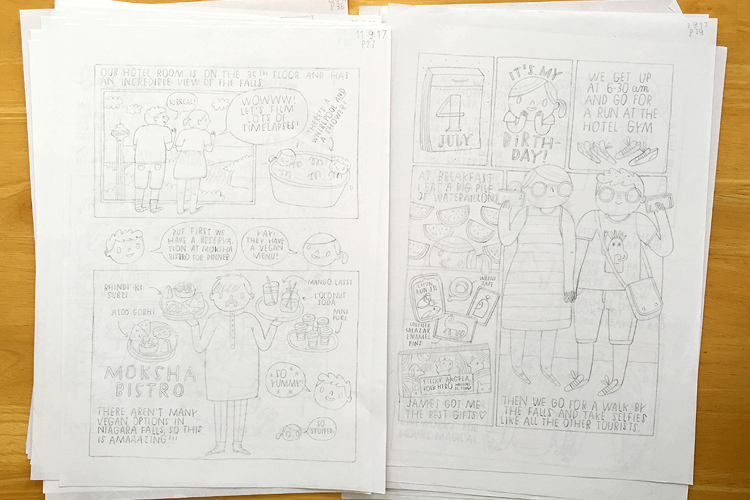 At this stage I drew each page layout pretty neatly with a mechanical pencil onto A4 sized layout paper. It's pretty close to the final drawings, I only tweaked small details while inking. 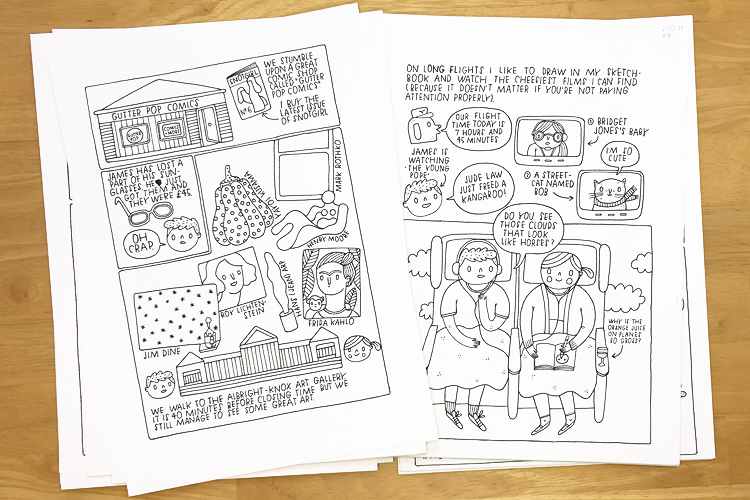 The whole book is inked by hand on paper and hand-lettered, too. Ouch! This was the stage where my hand was really aching but it was also the most fun and satisfying part of the process. It's A4 Fabriano drawing paper, with a bit of texture. I love it because it makes the lines look so much nicer than smooth paper. 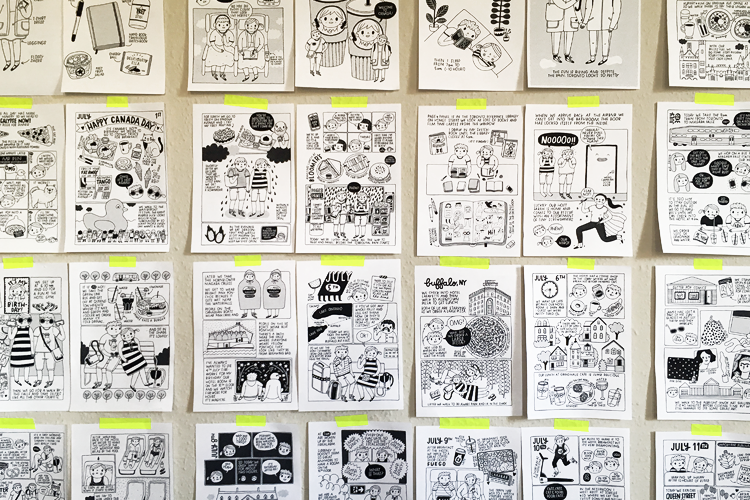 After scanning all 40 pages, I cleaned up any smudges in Photoshop and 'coloured' the pages (i.e. I added black areas and screentone). I also tweaked the layout, corrected typos/mistakes, added a few small things...) This stage took a lot longer than I had expected. I printed out each page and taped them up on the studio wall so I could see my progress and also see how it would all look together! 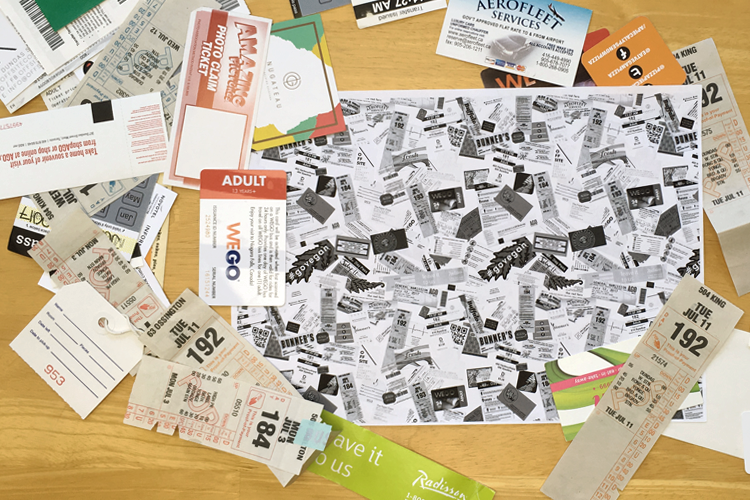 During our trip I collected a lot of tickets, bits of paper, business cards etc which I scanned and turned into a repeat pattern for the endpapers of the book. The cover was such a nerve-wracking thing because after all this work I wanted it to be something I would be 100% happy with. No pressure, right? Sometimes things are fun and ideas come easily, but with all this pressure I had zero ideas. I made so many different sketches, none of which worked, until I came up with this one. It wasn't until I draw the elements separately and moved them around that the final version came together. Now it was time to put everything together in InDesign and to ask the printer to send over a lot of paper samples. I wanted the paper to be perfect as well, something beautiful with some texture that would make the final product beautiful and hopefully even more fun to read! 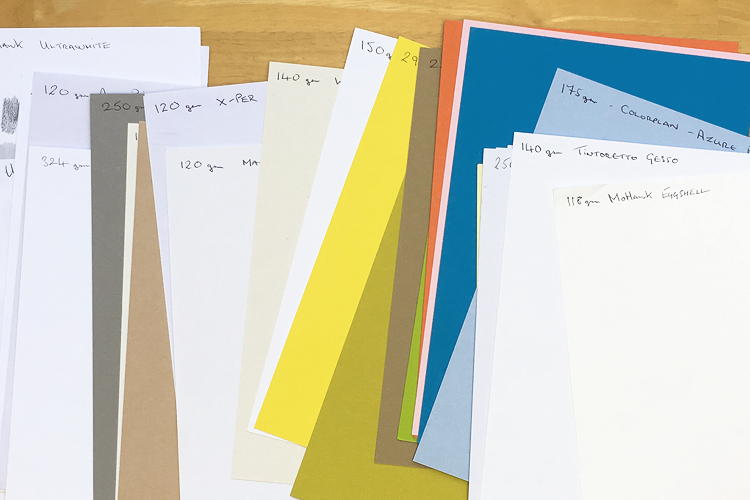 I then asked the printer to send me two printed proofs on different papers that I liked and ended up choosing Mohawk Superfine Eggshell paper (it's so lovely!). 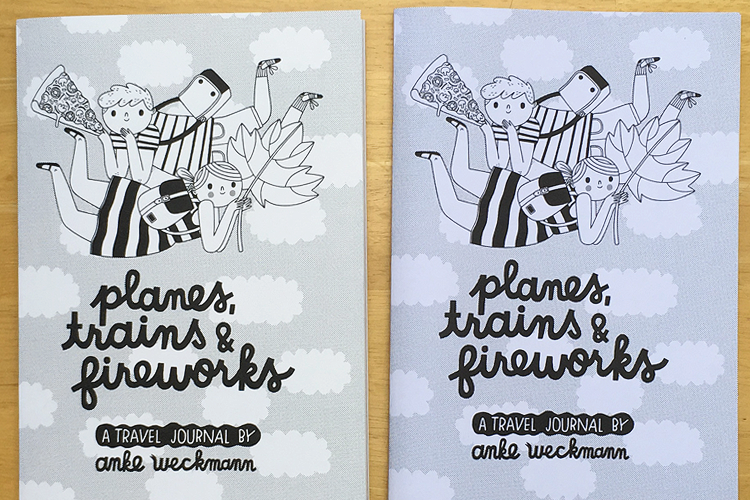 I also realised that the illustration wasn't centred properly on the cover, so I fixed that before sending the travel journal off to print. 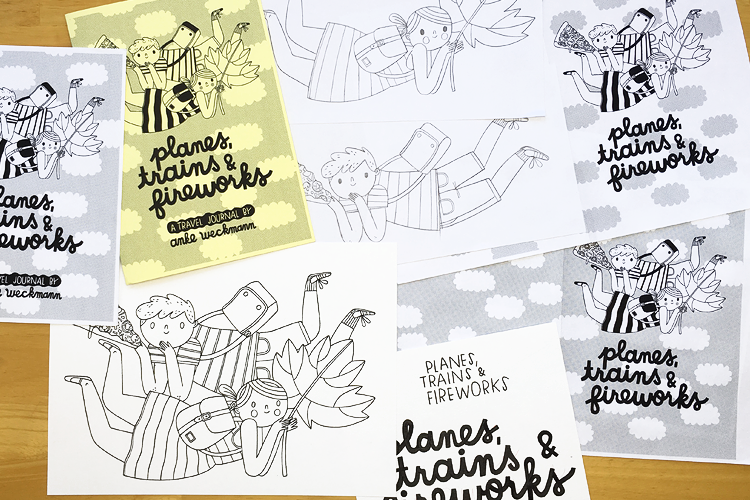 And that's the end of this very long story behind the making of PLANES, TRAINS & FIREWORKS. I love seeing/reading behind-the-scenes and hope you enjoyed this! 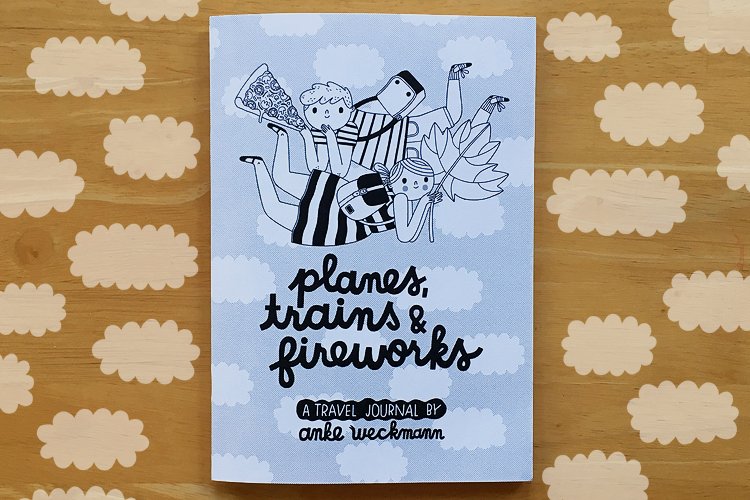 There are more details and peeks inside here in my Etsy shop. WOW! What a beautiful project! 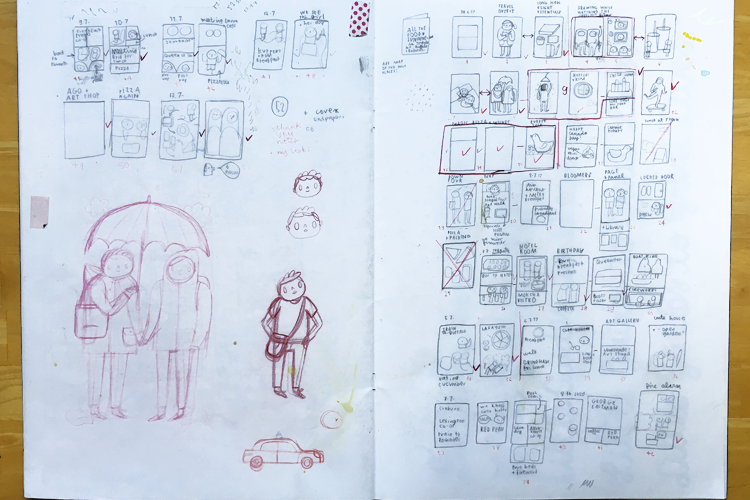 Thank you for sharing the process, only reading a blog post like this, one can grasp a bit of how much work goes into a journal like this one. Congrats on this beautiful product and achievement! Thank you so much for sharing the process. It was really nice to see all the steps and hard work needed to get to the final product. Already order a copy, but now that I read this blog post I'm even more exited to received it.